There’s no doubt that plastic is a problem – from production, right through to disposal. The campaign against plastic waste has gripped the public’s imagination, and people are rightly looking to larger enterprises to step-up, and champion the cause. 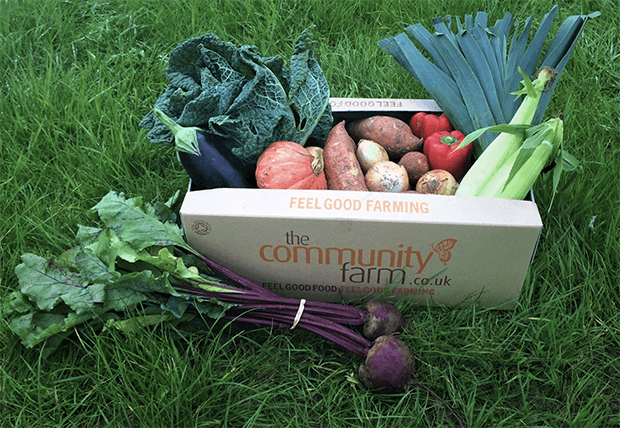 The Community Farm is a community-owned social enterprise, based in the Chew Valley between Bristol and Bath. The launch of its plastic-free boxes coincides with its existing commitment to reducing unnecessary plastic in all of its operations. As well as these new boxes, their team recently replaced plastic tomato punnets with cardboard ones, a simple move that prompted a chorus of approval on social media. “We don’t buy in, wrap or package our products unnecessarily,” Ped assured us, “We work directly with growers, allowing us to reduce the need for wrapped vegetables and fruit, like tomatoes, peaches, nectarines and cucumbers”. It’s an unavoidable fact that the food and farming industries rely heavily on plastic use to maintain freshness and product quality. Without plastic, greens like chard and spinach would wilt and rot much faster. Paper bags are prohibitive, as they dry out many of these products, and placing loose greens in vegetable boxes can quickly reduce their quality due to atmospheric changes. That’s why items such as Kale will not be available in The Community Farm’s plastic-free boxes. However, there are still plenty of roots, shoots and fruits to enjoy from their fields without contributing to our landfills. Quit using plastic straws, even when eating at a resutarant. Instead, reach for a reusable stainless steel or paper straw. Invest in a reusable produce bag. Some plastic bags can take up to 1,000 years to biodegrade. If you buy your own sturdy shopper, you can use it time and again. Buy boxed detergent instead of plastic bottles. Cardboard is more widely recycled and won’t cost the environment as dearly. Where possible, purchase cereal, pasta, and rice in bulk and use your own containers. The Community Farm’s Veg No Plastic boxes are available online at www.thecommunityfarm.co.uk/boxes.